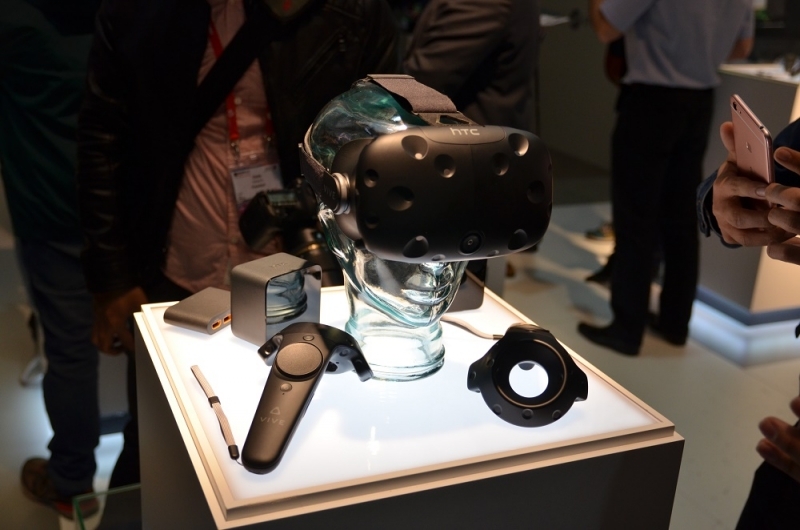 The HTC Vive was one of our ‘Best of Mobile World Congress’ picks and with good reason. The virtual reality device may be a pretty hefty $799 -- a full $200 more expensive that the Oculus Rift -- but it provides a truly breathtaking experience and a level of immersion that has to be tried to be believed. Today, fans of the VR headset are able to pre-order the Vive. Prices outside the US vary: The headset will sell for €899 in Europe, £689 in the UK and AU$817.27 in Australia. Those who pre-order will receive the headset, two wireless controllers and two base station tracking sensors. Buyers will also get three VR games bundled in with the Vive: Fantastic Contraptions, a building game where you construct objects to solve puzzles; Job Simulator, a tongue-in-cheek title set in the future where robots have taken the place of human workers; and Tilt Brush, which lets users create 3D paintings with brushes that ‘paint’ using light. I tried Tilt Brush at MWC, and despite having absolutely no artistic talent, I found that I didn’t want to stop creating images. HTC argues that the Vive, which it developed in collaboration with Valve, gives a better VR experience than the Oculus because it utilizes an entire room. While the Vive can be used sitting down, walking around in virtual reality improves the immersion enormously. The only issue may be the sheer amount of space that’s required to set up the device. System requirements for the Vive are almost the same as the Oculus: an Intel i5-4590 or equivalent, GTX 970/AMD R9 290 and Windows 7.1 SP1 or newer. The few differences are that the Rift requires 8GB+ of RAM, a HDMI 1.3 video output, two USB 3.0 ports and one USB 2.0 port; whereas the Vive asks for 4GB+ of RAM, HDMI 1.4 or Display Port 1.2, and just the one USB 2.0 port. Not every user is convinced that virtual reality will be the revolution Oculus and HTC promise, and the price of both headsets may prove to be a bit steep for a lot of consumers, but it’s going to be interesting to see how the general public takes to the devices. Ultimately, the biggest factor that influences their success or failure may be the amount of support developers give the headsets.